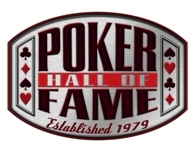 Nominations for the Poker Hall of Fame were opened to the public earlier this week. Poker players and fans from all over the world over the age of 21 may visit WSOP.COM and nominate any person they wish as a candidate for the Poker Hall of Fame. The nomination process is only the first step towards selecting who will ultimately be enshrined as the “Class of 2012.” Usually, no more than one or two persons are inducted each year. After nominations are accepted and closed, the top ten nominees will be placed on an official ballot. Those ballots will then be sent to a special voting committee, comprised of all existing Poker Hall of Fame inductees (living) and established media who have demonstrated a knowledge and commitment to the game for many years. Persons who receive the most votes from the members of the special committee will become enshrined into the Poker Hall of Fame — as the Class of 2012. The official induction ceremony takes place on the night of the WSOP Main Event Championship finale, to be held in Las Vegas in late October. Fortunately, everyone seems to have gotten it right in recent years. The most recent classes of inductees have been extraordinary. Mike Sexton (2009), Erik Seidel and Dan Harrington (2010), and Barry Greenstein and Linda Johnson (2011) were about as deserving a lineup of inductees as was possible. Two years ago, I had the great honor of giving the official induction speech for Dan Harrington. I consider that rare privilege to be one of the highlights of my career in poker. I put forth this background material in an effort to demonstrate how seriously I take the Poker Hall of Fame and how much I am determined to enhance the shrine to the game’s greats. Yet for all of my obvious passion for poker and undeniable appreciation for its rich history, until this moment, I have never gone on record in support of a candidate. I hereby go on record to announce, promote, and advance the nomination of David Sklansky into the Poker Hall of Fame. Sklansky has done more for the game of poker than any person not already enshrined in the Poker Hall of Fame. He’s best known as a player and writer. But his contributions extend way beyond what he’s accomplished as a player or an author. Knowing Sklansky as I do, I believe he would most covet the title of being a theorist. Indeed, Sklansky is a theorist. A thinker. An intellectual. A polemic. Sklansky was the very first to approach poker as a science. He approached poker in the way a scientist toils in chemistry or physics. Over the years, his master works ELEVATED the game of poker and ADVANCED the concept of poker as a game of skill. In short, his approach to the game transformed poker from being just a common recreational activity to a bona fide academic exercise, meritous of respect, by those both in and out of the game. Overall, Sklansky has written 13 books — not just on poker but on other forms of gambling, as well. However, all of his material has been extraodrinarily unique in one way, which is his concentration of wagers and situations which offer positive expectation. Anyone who inists “you can’t win gambling,” has never read David Sklansky. Alas, Sklansky’s quantity and qaulity of writings alone give him enough credentials for serious consideration. But when one also considers what he’s done as a player and casino industry consultant, this clearly puts him way over the top. 1. Has clearly stood the test of time. He has been active in the Las Vegas poker scene since the mid-1970s. 2. Has been a successful cash game player for four decades. 3. Has won three World Series of Poker gold bracelets. 4. Nearly $1.4 million in career tournament earnings, even though he only plays a limited number of events. 5. Well respected industry consultant to Lyle Berman, Bob Stupak, and others. 6. Created and patented various casino games. 7. Highly-respected teacher and lecturer. Has given more than 100 strategy seminars over the years. 8. Wrote (or co-wrote) 13 books — ten of which were on poker. He has written books on virtually all variations — including Hold’em, Seven-Card Stud, Razz, small stakes poker, tournament strategy, and general theory. 10. Has a stellar reputation for integrity and protecting players..
(Personal Note: I am sure there are more — I have listed these contributions off the top of my head). A more personal note about David Sklansky: Let’s be honest. Sklansky is not a warm and fuzzy character. But induction into the Poker Hall of Fame should not be a popularity contest. I spoke to him at the 2012 World Series of Poker. We talked about his exclusion from the Poker Hall of Fame. Sklansky was not bothered by his ommision in the least, which surprised me. In fact, he expressed no need nor desire to be inducted. Sklansky went on to mention that he probably deserved to be inducted many years ago (I agree), and has now pretty much given up on the process. Sadly, most of the general public lacks the knowledge and awareness to make the right decision when it comes to David Sklansky, and others. By “others,” I mean persons who have dedicated their lives to the game, but are not as well known. Of course, anyone who has any association whatsoever with the game in any way cannot deny the immeasurable contributions of this man. Accordingly, I urge you to do two things. First, go to WSOP.COM and nominate a candidate. Second, I urge you to consider nominating player, author, and consultant David Sklansky — the most deserving person of anyone I know into the Poker Hall of Fame — Class of 2012. Note to Media: Any and all of this text may be copied and reproduced in any way.